Industrial Gas Turbine Market Trends « Global Market Insights, Inc. The rising demand for electricity coupled with the shift of preference toward gas fired technologies will expedite industrial gas turbine market over the coming years. These turbines are inherently internal combustion engines which fire an air & fuel mixture to generate hot gases, that are used heavily across the power generation, manufacturing, and O&G sectors. Governmental concerns with regards to the harmful GHG emission effects from coal fired plants is also forecast to propel the expansion of industrial gas turbine market. Of late, regional governments have been striving to make noteworthy financial contributions toward the manufacturing of new gas-fired generation facilities that will propel industrial gas turbine industry trends. For instance, in 2017, the U.S. regulatory bodies approved a plan by Xcel Energy for replacing its 680 MW coal fired plant with a 786 MW gas fired power station. Such consistent efforts by government entities and other regulatory organizations is likely to positively impact global industrial gas turbine market. Reduction in GHG emissions is one of the principal factors that would expedite industrial gas turbine market across major geographies across the globe. China specifically, is one of the most profitable growth grounds for the expansion of this industry. In 2016, the nation of China introduced a new set of action plans aimed at reducing GHG emission levels to 18% by 2020. In fact, the supportive regulatory landscape of the country has been instrumental in aiding the growth of the regional industrial gas turbine market. The nation’s government has been striving toward the development of huge, lucrative gas fired power projects as well as clean energy integration. Prominent global manufacturers have lately been shifting their focus toward expansion across China, primarily owing to the surge in demand and a supportive statutory regime. The renowned Siemens for example, in 2018, obtained supply orders for two of its H-class gas turbines for the CHD Guangzhou Zengcheng project. The U.S. is another avenue that would expedite the industrial gas turbine market across the globe. The U.S. Federal Government apparently has plans to reduce GHG emission levels to 28% by 2025. Furthermore, the region is a powerhouse of research & development programs that demand a slew of investments from the government. Additionally, the deployment of combined cycle generation systems has been gaining precedence, which would further impact the product demand in the nation. According to the ICF International, turbines manufactured by the U.S. companies in the year 2016, contributed to more than 70% of the working natural gas-fired combined cycle projects in the country. 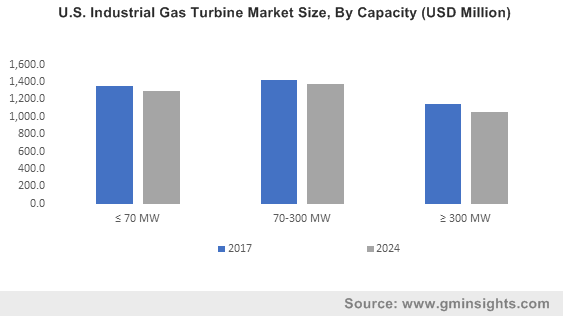 Driven by a supportive regulatory framework and the plethora of R&D programs in gas turbine technology, U.S. industrial gas turbine market is expected to exceed an annual installation of 3 GW by 2024. Major players in global industrial gas turbine market include Man Diesel & Turbo, Mitsubishi Hitachi Power Systems, Kawasaki Heavy Industries, Ansaldo Energia, Bharat Heavy Electricals Limited, General Electric, Zorya-Mashproekt, NPO Saturn, Vericor Power Systems, Siemens, Cryostar, Capstone Turbine, Harbin Electric, and Opra Turbines. Major industry players have been working to expand their presence across the globe. Pricing still remains a major factor considering business expansion, on account of which huge corporations tend to adopt myriad inorganic strategies to consolidate their position in the market. Private bodies and government entities have also been making major investments in order to replace traditional systems with high-grade systems, owing to the latter’s improved power to weight ratio, high power rating, and compact size. Also rising number of investments toward shale gas exploration activities will impel industrial gas turbine market size, which will surpass 20 GW By 2024. This entry was posted in ENERGY, MINING, OIL AND GAS and tagged Industrial Gas Turbine Industry, Industrial Gas Turbine Manufacturers, Industrial Gas Turbine Market, Industrial Gas Turbine Market Analysis, Industrial Gas Turbine Market Growth, Industrial Gas Turbine Market Outlook, Industrial Gas Turbine Market pdf, Industrial Gas Turbine Market Price, Industrial Gas Turbine Market Report, Industrial Gas Turbine Market Share, Industrial Gas Turbine Market Size, Industrial Gas Turbine Market Trends.